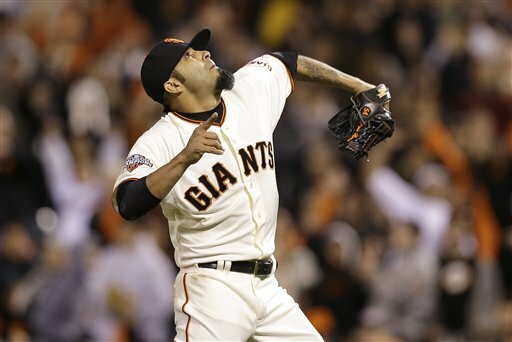 San Francisco Giants’ Sergio Romo added to All-Star team; Is Hunter Pence next? 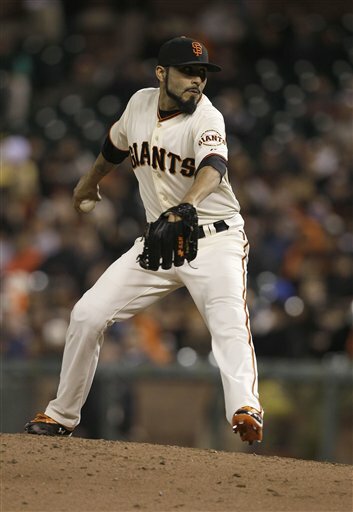 Sergio Romo was added to the NL All-Star roster on Sunday. Following through on a pledge he made Friday, San Francisco Giants manager Bruce Bochy selected closer Sergio Romo as an injury replacement to the National League All-Star roster on Sunday. Pirates pitcher Jeff Locke and Nationals pitcher Jordan Zimmermann announced that they would not participate in Tuesday’s game in New York because of minor injuries. Bochy replaced Locke and Zimmermann with Romo and Pirates reliever Mark Melancon. That give the Giants four players on the All-Star roster with Romo joining reserves Buster Posey, Marco Scutaro and Madison Bumgarner. Bochy will need to make at least two more replacement selections. Cardinals pitcher Adam Wainwright is scheduled to start Sunday night’s game against the Cubs, making him ineligible to play in the All-Star game. However, Bochy cannot announce a replacement for Wainwright until he actually throw a pitch in the game, which doesn’t start until 5 p.m. Pacific Time. I would expect Bochy to turn another Cardinal to replace Wainwright. That’s what he did with Locke. Two possible Redbird options are starting pitcher Shelby Miller or reliever Edward Mujica. Braves first baseman Freddie Freeman, who on Thursday won the All-Star Final Vote as the final addition to the roster, suffered a jammed thumb on Saturday and will not play Tuesday. Freeman beat out the Dodgers’ Yasiel Puig, Giants’ Hunter Pence, Nationals’ Ian Desmond and Dodgers’ Adrian Gonzalez in fan voting, in that order. Considering Puig, the runner-up in fan voting, has been sidelined this weekend by a sore shoulder, Bochy may select Pence as a replacement for Freeman. Pence finished third in Final Vote voting. However, San Jose Mercury’s Alex Pavlovic reported that Bochy is leaning to a third catcher to replace Freeman. If that’s the case, the Rockies’ Wilin Rosario would be at the top of the list. 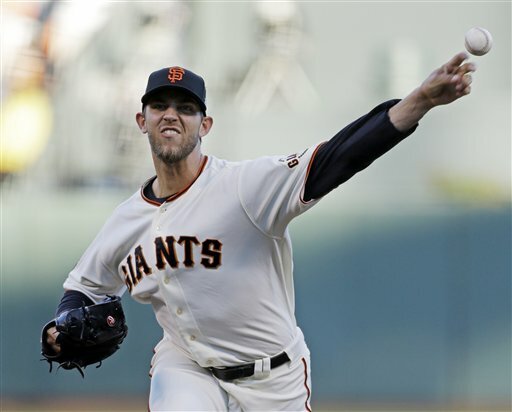 Cubs 4, Giants 3: Has Bochy gone to the Romo well a bit too much this season? Well, you knew it couldn’t last forever. Sergio Romo was absolutely brilliant through the first 10 games of the year. He was 6 for 6 in save opportunities, had an ERA of 0.00 and had only allowed two baserunners. But Wrigley is Wrigley, and the Cubs used the wind to their favor. After the Giants rallied for three runs in the top of the ninth to take a 3-2 lead, Dioner Navarro greeted Romo in the bottom of the ninth with a wind-blown solo home run to right. 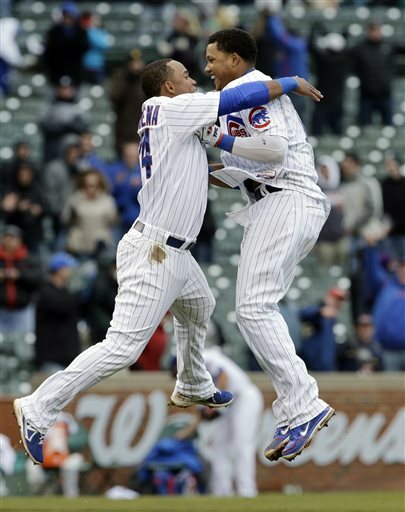 It was the third wind-blown homer of the day for the Cubs. All three would have been outs on Thursday. All three would have outs at AT&T Park — well, at least two would have been for sure. It spoiled what looked to be another great day to be a Giant. After being stifled for 7.1 innings by Carlos Villanueva, the Giants finally got into the Cubs’ shaky pen and it paid off in the ninth. Marco Scutaro started the rally with a one-out double to left-center. Pablo Sandoval followed with a bloop single to right, scoring Scutaro. Buster Posey was hit by a pitch. After Hunter Pence forced out Posey at second (on a play that look REALLLLY close to being a double-play), Brandon Belt lashed a double to right, scoring Sandoval and then Pence all the way from first for the lead. With Romo in the ninth to close it, it looked like game over. But not on Friday. Not at Wrigley. But Romo then got the next two Cubs out, and announcers Duane Kuiper and Mike Krukow raised a good point. Lefty Javier Lopez was warming up in the bullpen, and they wondered whether manager Bruce Bochy would bring in Lopez to face the left-handed DeJesus. Krukow’s point, and I would agree, was that Romo’s job was to get the save. Now, with that gone, there’s no point taxing Romo with more pitches, especially when he was pitching in his fourth game in five days. (I would also argue that Bochy should not have used Romo to protect a three-run lead in the ninth inning Tuesday against the Rockies). But Bochy left Romo in to face DeJesus. Romo was one strike away from ending the inning. But he tried to sneak a fastball by DeJesus, which he promptly laced to center for a single. Then he made the same mistake to Starlin Castro. Slider, slider, slider for a 2-1 count. Then, on his 20th pitch of the inning, a fastball that Castro doubled off the wall in right center for the game winner. The Giants talked this spring about not overworking Romo as he makes the transition into a full-time closer. And yet, 11 games into the season, Bruce Bochy has turned into Dusty Baker. Hopefully, if some good comes out of this loss, it will make the Giants rethink how they use Romo in the future. There were several good things to talk about after Monday’s win over the Colorado Rockies — Hunter Pence‘s three-run homer, Buster Posey‘s first RBI of the season, Madison Bumgarner battling through a less-than-perfect outing to earn the win. All good topics, but we are going to give it up to the bullpen. After Bumgarner left with two out in the sixth, Santiago Casilla, Jeremy Affeldt and Sergio Romo came in and retired 10 of the final 11 batters the Rockies sent to the plate, six of them by strikeout. The only batter to reach was Josh Rutledge, who doubled off Romo to lead off the ninth. Rutledge was the first batter that Romo has allowed to reach base off him this season. In fact, going back to last postseason, Romo had retired the last 24 batters he had faced — nine this regular season and the final 15 of the postseason (9 in the World Series and the final five of the NLCS Games 5, 6 and 7). But after Rutledge’s double, Romo shut the door with strikeouts of Chris Nelson, Todd Helton and Wilin Rosario. When protecting a lead, Giants relievers have an ERA of 0.87 with only two hits and no walks allowed in 10.1 innings. In all games, Giants relievers not named George Kontos have a combined ERA of 1.62. The Giants’ win Monday was their seventh in a row against the Rockies dating back to last September. Bumgarner wasn’t early as sharp Monday as he was last Tuesday in Los Angeles. But he muddled through to keep the Giants in the lead. He gave up two runs on five hits and five walks over 5.2 innings. He struck out five. Buster Posey looked lost against Jorge De La Rosa, striking out twice and popping out. But against Chris Volstad in the eighth, he slapped a pitch into right field for an RBI single, his first RBI of the season. Pence’s three-run homer to left was this third of the season in just seven games. It took him 38 games last year to hit his third home run after being acquired by the Giants from the Phillies. It was his second at AT&T this season. He only hit two last season at AT&T as a member of the Giants over a span of two months. MoreSplashHits got up Friday thinking how great it would be to be at AT&T Park for the pre-game festivities, but at least I could watch it on TV. Then I turned on the MLB Network, which was carrying Friday’s Giants-Cardinals game. But instead of showing the pre-game, the network decided to show Brian Kinney and Harold Reynolds blabber at each other. OK, no problem. I’ll just go to MLB. TV. But MLB.TV also did show the pre-game, joining the broadcast right before the first pitch. So, we’d like to thank SFGiants.com show sharing video of the highlights of Friday’s pre-game activities as the Giants raised their 2012 World Series banner. And it almost turned out like we called it. MoreSplashHits posted 10 prime candidates to raise the flag on Friday. 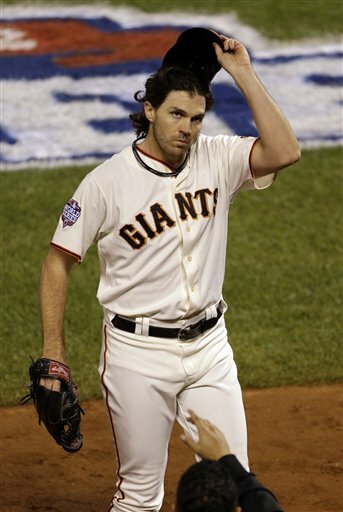 Two of them did not participate, as we expected, because they were getting ready for the game: Pitcher Barry Zito, who was warming up in the bullpen, and catcher Buster Posey, who was catching Zito. Two other players we listed did not hoist the flag, but were given another honor. NLCS MVP Marco Scutaro and World Series MVP Pablo Sandoval got to throw out the ceremonial first pitches. 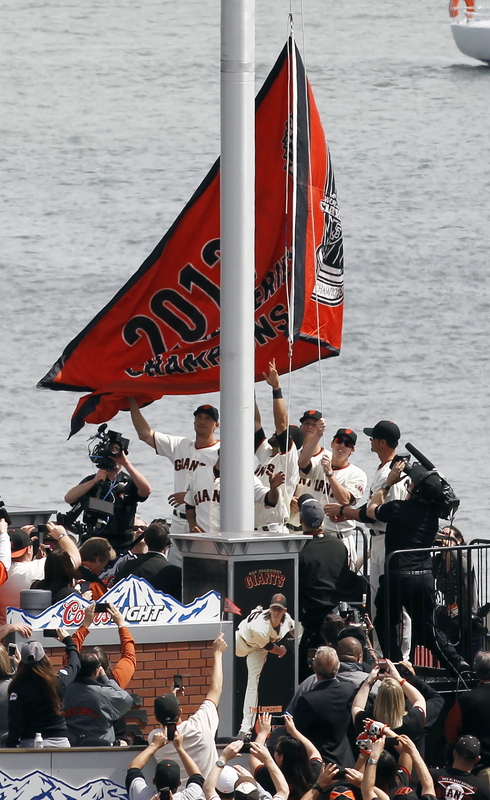 As for the flag itself, it was brought in via the bay on a San Francisco fire boat. 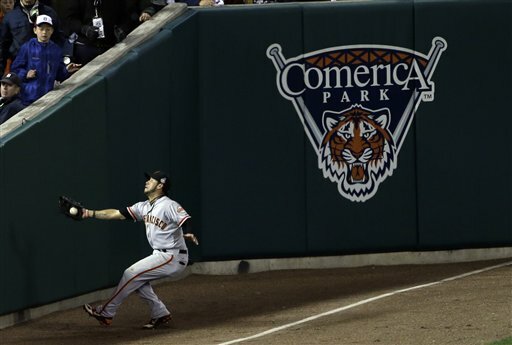 After it was carried into the stadium, it was handed to Giants manager Bruce Bochy, who walked it to the outfield wall, and passed it off to pitcher Matt Cain. OK, we didn’t get Pagan, but 9 out of 10 isn’t bad. Actually, when I was compiling my list of candidates, I wanted to have five pitchers and five position players. After coming up with Pence, Scutaro, Posey and Sandoval, I needed one more. I went with Blanco because he’s defensive plays in the postseason stuck out more in my mind. But I could have gone with several candidates like Brandon Crawford (for his defense) and Pagan. Pagan was a solid choice for his contributions from the start of the season through the playoff run. And he just signed a four-game contract with the Giants last winter. Good choices all the way around, and it was a great ceremony. Still, it would have been nice to see Buster in the mix. 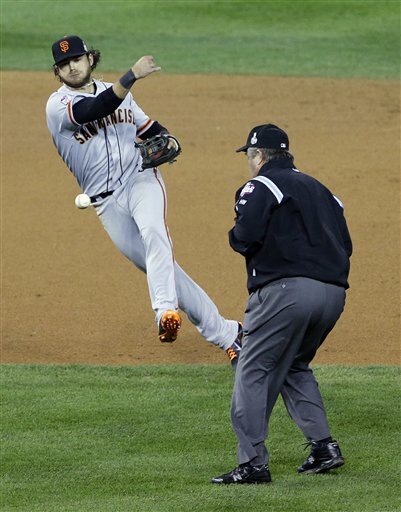 “Aw, I had fun watching ’em,” Posey said of his teammates. Don’t feel too bad for Buster. He’ll get his time in the spotlight Saturday when he’ll be presented his MVP trophy in a pre-game ceremony. So there I was, working on a blog post about how the Giants needed to clean up one piece of off-season business and get Sergio Romo signed. 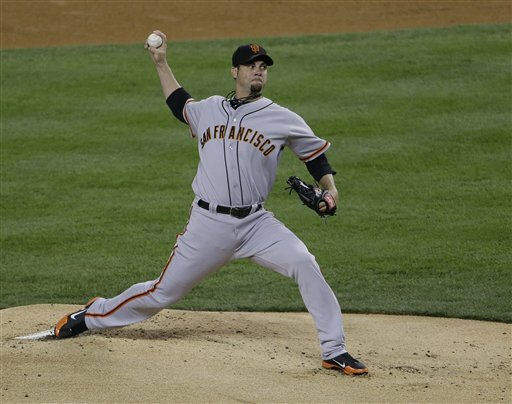 And then came news Wednesday that the reliever agreed to a two-year deal with the Giants. Terms were not disclosed. 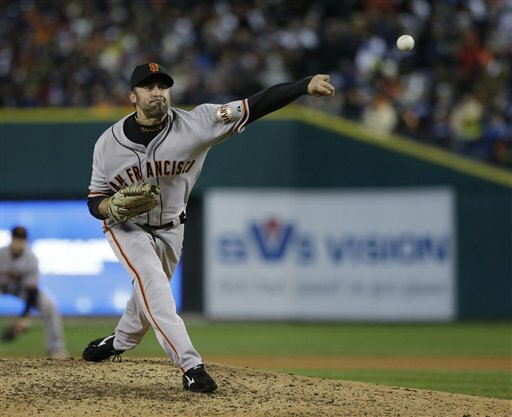 Romo was the last of the Giants’ arbitration-eligible player to not agree to a 2013 contract. And we were about to guess at possible explanations for that. One possible explanation was that Romo and the Giants were working on a long-term deal, and they were close. If they had been far apart, they would have just agreed on a one-year deal and attack a longer deal later on. Generally a team would like to buy out some free agent years. But this would appear to be a good deal for the Giants. Romo was a second-year arbitration eligible player. A two-year deal buys out Romo’s last year of the arbitration process. He would be a free agent after the 2014 season. But he’s not exactly a spring chicken. He will open the 2013 season at 30 years old (his birthday is March 4). So this deal will give the Giants time to access Romo’s durability, particularly in the closer role which he figures to fill in the 2013 season. Romo asked for $4.5 million in arbitration this year. The Giants countered with $2.675 million. If we had to guess the dollar amount of this deal, we would guess at about $8 million or $9 million. Romo would need some motivation to give up his final year of arbitration, in which his salary could have jumped above $5 million. 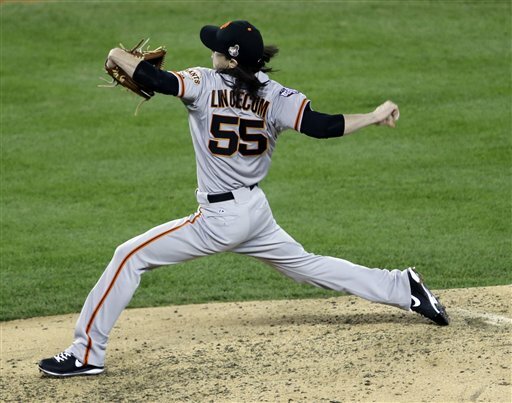 Romo started 2012 as an eighth-inning set-up man, and continued into that role into July, when injuries and Romo’s success prompted manager Bruce Bochy to go to Romo in the closer role down the stretch and into the postseason. Romo was 4-2 with 1.79 ERA in 55.1 innings last year. He’s had a K-rate at 10.0 and above each of the past four seasons, and a WHIP under 1.00 each of the past three seasons. He recorded four saves in four opportunities in the postseason, including the final three games of the World Series. He allowed only one run in 10.2 innings in the postseason. Pablo Sandoval was the MVP of the 2012 World Series. And that was an easy call. The Panda hit .500 (8 for 16) with three home runs, four RBI, a double and only two strikeouts. And, of course, he had the three-homer game. LHP Madison Bumgarner 7 IP, 2 hits, 0 runs, 2 walks, 8 strikeouts, 1 win. 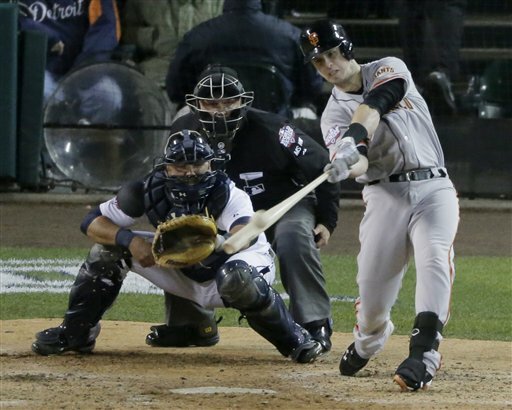 C Buster Posey, 4-15 (.267), HR, 3 RBI, caught outstanding series, two shutouts. When Brian Wilson went down for the season, Giants manager Bruce Bochy said he would go with a closer-by-committee. That committee quickly became Santiago Casilla. Through June 18, Casilla had allowed four earned runs in his first 30 appearances, never allowing more than one run in any appearance. Only twice did he allow two hits or more in any of those appearances. He had 19 saves in 19 appearances with a 1.32 ERA. But since then, Casilla has given up six earned runs in 4 1/3 innings. He’s allowed at least two hits in four of his last five outings. He’s blown three of his last four save opportunities. Is this a funk? Or is something wrong with Casilla? The Giants said Casilla would not be avaiable Saturday because of a blister on his middle finger. 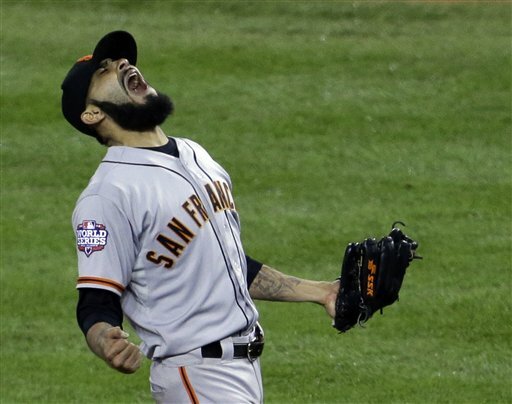 But if the Giants don’t make a move to Sergio Romo as their new closer, Giants fans may want to show Bochy THEIR middle finger. Romo has been lights-out nasty this season. He’s 2-1 with a 0.72 ERA. He’s 5-for-5 in save opportunities. In those save opportunties (all occurring since June 2), Romo has not allowed a hit or a walk in 4 1/3 innings. He has four strikeouts in those outings. Romo locked down the save Friday in Pittsburgh. Afterward, Romo said he doesn’t want or need the closer title, throwing his support behind Casilla. “Casilla’s done a great job for us this year … Who doesn’t have a rough patch during the season?” Romo said. Who doesn’t? Um, Sergio, you don’t. Or at least you haven’t the past two seasons. It’s a nice sentiment, Sergio. But it’s not your call. It’s Bochy’s. It’s his job to put the right people in the game that give the team the best chance to win. And right now, it’s Romo. Casilla may just need a breather. He’s pitched more innings up to this point in the season than he’s ever done in the past. His season-high for innings was 55.1 in 2010. He’s pitched between 48.1 and 55.1 each of the past five seasons. So we say move Casilla back into the set-up spot for now. Let him catch his breath and regain his confidence.